We’d love your help. Let us know what’s wrong with this preview of The Fever by Sonia Shah. In recent years, malaria has emerged as a cause cÃ©lÃ¨bre for voguish philanthropists. Bill Gates, Bono, and Laura Bush are only a few of the personalities who have lent their namesâ€”and opened their pocketbooksâ€”in hopes of curing the disease. Still, in a time when every emergent disease inspires waves of panic, why arenâ€™t we doing more to eradicate one of our oldest foes? And how does a parasitic disease that weâ€™ve known how to prevent for more than a century still infect 500 million people every year, killing nearly 1 million of them? In The Fever, the journalist Sonia Shah sets out to answer these questions, delivering a timely, inquisitive chronicle of the illness and its influence on human lives. Through the centuries, she finds, weâ€™ve invested our hopes in a panoply of drugs and technologies, and invariably those hopes have been dashed. From the settling of the New World to the construction of the Panama Canal, through wars and the advances of the Industrial Revolution, Shah tracks malariaâ€™s jagged ascent and the tragedies in its wake, revealing a parasite every bit as persistent as the insects that carry it. With distinguished prose and original reporting from Panama, Malawi, Cameroon, India, and elsewhere, The Fever captures the curiously fascinating, devastating history of this long-standing thorn in the side of humanity. To ask other readers questions about The Fever, please sign up. I'm going to start this review by noting that I am a malaria researcher, myself, and thus am already familiar with much of the material Shah presented in this book. This, of course, affects the way I read the book and my perception of it. My first gripe with the book is that, to me, the story seemed to be set up in a strange way. The author seems to have broken the book up into a short discussion of the parasite (Plasmodium species), a moderate length discussion on the host (humans, in this case) I'm going to start this review by noting that I am a malaria researcher, myself, and thus am already familiar with much of the material Shah presented in this book. This, of course, affects the way I read the book and my perception of it. My first gripe with the book is that, to me, the story seemed to be set up in a strange way. The author seems to have broken the book up into a short discussion of the parasite (Plasmodium species), a moderate length discussion on the host (humans, in this case), and a lengthy discussion on the vector (mosquito, Anopheles species). While it is important to understand the roles of all three species in understanding malaria's history and continued prevalence, the way this is done seems to skip out on things in the early chapters without mentioning that they will be discussed later, and then talk about various things in later chapters without tying back to things that were discussed earlier. Perhaps this is evident to me already coming in with a background in the subject, but would not be as evident to those who are unfamiliar with malaria research. My other issue with the book is that the author, who is a journalist, not a scientist, is clearly trying to tell a story rather than simply presenting the facts (which, frankly, would not be all that interesting and is what we have scientific journals for). As a result, however, there is sometimes a slant to the story, and it feels that we're not getting the whole picture. Also, the sarcastic tone that seems to be present here and there makes it difficult for me to take the author seriously. Also, the author does point this out, but I think the point is not belabored well enough: MALARIA EXIST OUTSIDE OF AFRICA, TOO. Papua New Guinea has one of the highest malaria rates in the world and is mentioned roughly twice in this book? But this is not an issue strictly defined to this book—much of it has to do with all of the malaria eradication and elimination programs that seem to forget that when we talk about the developing world and infectious disease, we don't just mean Africa. Disclosure: This follows on the heels of Mountains Beyond Mountains: The Quest of Dr. Paul Farmer, a Man Who Would Cure the World and The Emperor of All Maladies: A Biography of Cancer, and I am an avid consumer of epidemiological histories, like And the Band Played On: Politics, People, and the AIDS Epidemic (an all-time favorite book of mine) which indubidably biased my reading of The Fever. The Fever suffers from being too short. I trying to be too many things in 240 pages+footnotes: a cultu Disclosure: This follows on the heels of Mountains Beyond Mountains: The Quest of Dr. Paul Farmer, a Man Who Would Cure the World and The Emperor of All Maladies: A Biography of Cancer, and I am an avid consumer of epidemiological histories, like And the Band Played On: Politics, People, and the AIDS Epidemic (an all-time favorite book of mine) which indubidably biased my reading of The Fever. The Fever suffers from being too short. I trying to be too many things in 240 pages+footnotes: a cultural history, an environmental and ecological history, a popular science work of microbiology and entymology, and a post-colonial history. The fascinating thing about malaria is that any book on this disease must be all of these things. And no author, no matter how good, can do that well in a book this short, a choice I'm sure that was made by an editor trying to capitalize on malaria's recent resurgence as a cause celebre(covered in the last chapter) with out scaring off a book reading public scared of anything over 300 pages. Malaria was a global phenomenon until lthe early 20th century and its prevalence until then accounts for the lack of habitation or agriculture in many otherwise arable and habitable places that remain relative uninhabited today: rural Georgia and Alabama, for example. It was fascinating to me that a disease that is today associated so heavily with the tropics would be responsible for the poor settlement of places like the Upper Peninsula of Michigan, where my mother's family is from: a decidedly non-tropical locale. Malaria did not recede from the developed world through aggressive tactics like those practiced in poor, tropical countries today, however. It receded because development destroyed mosquito habitats and increased herds of farm animals were more attractive sources of food for those mosquitos that remained. Shah gives the lie to people like economist Jeffrey Sachs, who claim that malaria creates poverty and eradicating malaria will also eradicate it: Poverty, she points, out, can create malaria, too. I really would have loved to hear more about the modern drug development efforts being made, and the efforts being made to deliver the drugs to malarious countries. I do believe, like a Nigerian health official quoted in the last chapter, that we have to find a way to manufacture these drugs in situ, as opposed to manufacturing them outside and then shipping them in, with all of the extra costs and difficulties that ensures. Malaria is a complex disease that cannot be summed up in a slogan or sound-bite. Ms. Shah does a good job of covering both how malaria affects people and the larger impact on history. She explains why control of malaria is much more difficult than for other diseases. For me the book bogged down a bit in the middle as she reported battle after battle in wars over thousands of years where the outcome was determined by malaria. Once she made that point and moved to the science and politics of moder Malaria is a complex disease that cannot be summed up in a slogan or sound-bite. Ms. Shah does a good job of covering both how malaria affects people and the larger impact on history. She explains why control of malaria is much more difficult than for other diseases. You know you’re into something special when you open a book randomly and find something compelling on every page. Sonia Shah performs a great balancing act in delivering the complexities of malarial science while keeping the storytelling brisk and riveting. The long history of the disease also provides her with rich pickings and some great anecdotes like that of Oliver Cromwell. He spurned one of the best and most effective treatments of the day, the ground-up bark of the cinchona tree, because it You know you’re into something special when you open a book randomly and find something compelling on every page. He spurned one of the best and most effective treatments of the day, the ground-up bark of the cinchona tree, because it had been brought to Europe by Jesuit missionaries. Anti-Catholic sentiment saw him dismiss it as “Jesuit’s Powder” and at 59 he died, 20 years after its introduction from South America. Had he tried it and survived would Britain’s constitutional monarchy ever have made a return? Another tale recalls sufferer Sir Walter Raleigh who, when captive in the Tower of London, prayed not to have a malarial fit on the scaffold in case people thought he was shivering with fear. And harking back to Roman times, there’s a story about Julius Caesar being struck down with malaria while, paradoxically, the disease-riddled swamps around the imperial city kept besieging foreign armies at bay. There’s more to this book than mere anecdotes though. There’s much to think about in Shah’s view of how the disease affected the culture and demography of the United States, creating “deep cultural prejudices…that persist to this day”. In documenting previous efforts to thwart the disease, she relates how drugs have been misused, strategies ill-thought out and quick fix “solutions” have been anything but. Environmental disturbance, climate change and mass movement of people have all been exploited by the parasite which continues to plague mankind. Attempts to combat the illness have occupied some of the world’s finest minds and have cost billions of dollars but it continues to survive and thrive. The lesson of the book is that there is no silver bullet, no single solution; nets, drugs, new technologies and good intentions cannot succeed on their own. The New York Times reviewed The Fever on July 26, 2010, in Drama! Intrigue! A Mystery? No, Malaria’s Story . Note: malaria is carried by mosquitoes of the genus Anopheles, whereas dengue, as well as yellow fever and Chikungunya come courtesy of the genus Aedes. Both genii survive in North America, and these diseases are almost non-existent becase "transmission has been interrupted through successful control/elimination programs", per the CDC. However, as temperatures rise, "transmission will be more intense" and will be "transmitted year-round". Combined with declining budgets, declining scientific awareness and the many other critical problems "climate change" is likely to bring, it seems like a good bet that malaria (et al) will become endemic in the southern United States. Sonia Shah hates mosquitoes, as do I.
I have occassion to help diaganosis Malaria, in an east coast medical center. When a patient is diagnosed, it is usually someone who was originally from a malaria infested area who has been living in the US (legal or otherwise). He or she goes back for a visit; and as they had not used anti-malaral medicines in their youth, they see no reason to spend the money. And when they come back they are sick with fever. Before reading Shah's explaination of limited lo Sonia Shah hates mosquitoes, as do I.
I have occassion to help diaganosis Malaria, in an east coast medical center. When a patient is diagnosed, it is usually someone who was originally from a malaria infested area who has been living in the US (legal or otherwise). He or she goes back for a visit; and as they had not used anti-malaral medicines in their youth, they see no reason to spend the money. And when they come back they are sick with fever. Before reading Shah's explaination of limited local immunity (due to the specific mosquito and specific strain of malaria), and the lack of immunity that happens, when the individual is absent from the specific locality for period of time. Shah took me by the hand and lead me through the tangle of information to a point of understanding. * the influence on the American slave trade. To anyone, who had an intrest in world history, history of medicine and/or contemporary world politics and enconomics; this is a must read. Why four stars and not five? 1. Sometimes the writing style is not as inviting as I would like. 2. Some mention of the use of Rapid Malaria testing cassettes and their acceptance should have been made. 3. Some graphs, maps and pictures would have added to the matter. But again a great effort and a worthy read. good history and easy-to-digest science regarding why malaria has been so devastating and so resistant to eradication efforts. Because a couple of my nephews went to a high school run by Jesuits, I was interested in the anecdote that Oliver Cromwell and other Protestants derided cinchona as "Jesuit's powder" and refused to use this malaria treatment, in Cromwell's case at the cost of his life. Jesuit missionaries had seen the cinchona bark work in South America and tried to bring it to Europe. O good history and easy-to-digest science regarding why malaria has been so devastating and so resistant to eradication efforts. Because a couple of my nephews went to a high school run by Jesuits, I was interested in the anecdote that Oliver Cromwell and other Protestants derided cinchona as "Jesuit's powder" and refused to use this malaria treatment, in Cromwell's case at the cost of his life. Jesuit missionaries had seen the cinchona bark work in South America and tried to bring it to Europe. Other treatments have come from ancient Chinese medicine, from manufacturing of synthetic chemicals, etc. etc. But they all have proven imperfect so far because the disease develops drug resistance, or the fix creates its own problems (e.g., spraying DDT on everything), or adherence is poor (depressing chapter on insecticide-treated bed nets was news to me in this respect), or all of the above. My colleague Katherine Robinson recommended this book. Exquisitely researched, it brings to light the way malaria has shaped human history, politics, and economics. The book is quite comprehensive and a bit depressing, since this virus seems to outwit us at every turn: and the few times we might have had the upper hand are squandered among competing interests (no surprise there!). Very, very nice. My family did not want to indulge me in discussing this book (because they are very fragile), but I swear this isn't some scare-your-pants-off Hot Zone thriller. It's just an interesting look at a disease that's been with us and shaped our civilizations and cultures since we were more great ape than human. Informative if a bit scattered in organization. I really liked this book. I felt like I was learning but I wasn't bored for a second. However, I am not despondent about ever eradicating malaria. People are too stupid, selfish and greedy to all work together to get rid of it. I am angry at the world. VERY interesting exploration of malaria, its evolution through history, how it has affected humans, how we try to fight it, and why it's not working. Fascinating. Interesting and engaging read. Ties together the biological, public health, political and economic elements involved in the history of malaria. 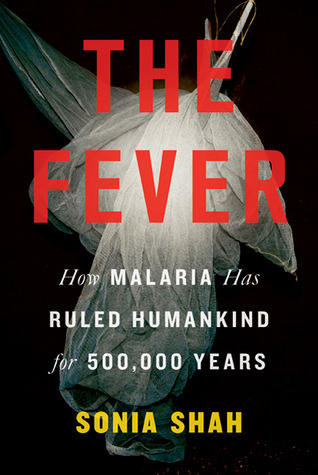 A very approachable history of malaria, one that integrates human behavior into the story more thoroughly than a more biology-oriented book would. Not that Shah skimps on the science; we do learn the basics of the parasite's life cycle, as well as the way it flourishes in only certain Anopheles vectors, which in turn are adapted to specific niches. I think Shah makes a strong argument for her thesis; colonialism and imperialism were significantly impacted by the presence of malaria - consider the multiple failed attempts to build the Panama Canal, as well as both failed and successful invasions into Africa - without ever making it sound as if malaria by itself was the sole guidance throughout these exploits. The discussion of inequities in the historical treatment of malaria is interesting as well, because in a sense it's flipped the other way today: philanthropists like Bill Gates seem to be obsessed with connecting the end of malaria to the end of poverty (and if you aren't familiar with how the Gates Foundation has completely taken over even the WHO's approach to malaria, sometimes flying in the face of proven methodology, and not exactly doing a great job of letting locals take the lead, you should read up on it). I am curious as to how much of the malaria story ties into generalities around tropical diseases during these time periods - granted, Shah does highlight the unique challenges around a disease whose parasite goes through, what, 7 different forms and multiple species. I read this after it was recommended on This Podcast Will Kill You and I could hardly put it down. Moving backwards and forward in time, hopping from continent to continent, mixing personal and historical fact... the narrative moves like a mosquito, but unlike one of those damn insects, it's not hard to follow and you don't lose track of it. The author does an excellent job with the finicky details of the life cycle of the malaria plasmodium. She also, very interestingly, manages to both impress I read this after it was recommended on This Podcast Will Kill You and I could hardly put it down. Moving backwards and forward in time, hopping from continent to continent, mixing personal and historical fact... the narrative moves like a mosquito, but unlike one of those damn insects, it's not hard to follow and you don't lose track of it. The author does an excellent job with the finicky details of the life cycle of the malaria plasmodium. She also, very interestingly, manages to both impress upon the reader the severity and danger of malaria, while calling into question the cultural context and motives of modern malaria research. Interesting to learn about the history of malaria and the effect it has on society. It hewed a little too much to editorializing in parts with a definite bias instead of showing both sides of the debate on how to control malaria. Also, one thing that bothered me but was small is that her footnotes don't seem to follow a standard style and don't follow a standard format throughout the book. She also cites references in other books that reference even another book. That is just poor research on th Interesting to learn about the history of malaria and the effect it has on society. It hewed a little too much to editorializing in parts with a definite bias instead of showing both sides of the debate on how to control malaria. History of Malaria. Current battles and how ridiculous they have been. And a nod also to the Gates Foundation and how it’s been at the forefront of bad ideas that have been tried before and found lacking. Of course, the solution is obvious right from the start - fund and empower local governments to deal with it so that they can also track it locally. A body sitting in NYC can hardly ensure success deep inside Gabon. But never happens. While I had a vague idea of the role malaria plays in the modern world I had no idea how it evolved or what impacts it had in the ancient world. Now I can say I do know and am glad of it. The author does an excellent job of writing in a way that makes what could be a dry and difficult work engaging and, in a way, entertaining, if that's the word for it. If you have any interest in this ancient disease and its impact on human life I highly recommend this work! The book is a good explanation of malaria both historically and how we are dealing with it today. The criticism of modern behaviour towards is mostly that we simplify some problems and ignore finding out if all the nets we give to people help anyone and measure improvement by number of nets given and ignore how the nets aren`t used correctly. The book biggest defect is that it writes about malaria as some scheming villain that no protozoan is. The book is a good explanation of malaria both historically and how we are dealing with it today. A fascinating and incredibly well-documented history of one of the most tenacious diseases humanity has ever encountered. The individual sections are incredibly thorough, but I'm not entirely convinced that the chosen order works for weaving together a single coherent thread - it seems to jump around both chronologically and thematically. Terrific book. I attended a talk by this author when this book first came out. Was amazed that Campbell Hall was not full - she was a good speaker, and the topic fascinating. Not to be a downer, but basically, we're doomed. The parasite adapts to our various defenses faster than we can invent them. Not only should you wear sunscreen, but bug spray, too! Very enlightening and informative. I definitely have a better understanding of the Malaria virus, its transmission and the medications used to treat it. I am personally a fan of journalists who write non fiction books. I think they tend to be concise and don't spend unnecessary time pontificating. I enjoyed reading this book. This review has been hidden because it contains spoilers. To view it, click here. I think that this book described the pains in malaria. we know that malaria has been a Pandemic for a really long time now. this book gave more deeper meaning in malaria they talked about the precautions for example what causes malaria, the treatments and effects it has in people. And you should. It has been a major factor in human civilization over the last million years and continuous to resist our efforts to eradicate or at least manage it. Beware, it may be coming to you. Sonia Shah is a science journalist and prize-winning author. Her writing on science, politics, and human rights has appeared in the New York Times, the Wall Street Journal, Foreign Affairs, Scientific American and elsewhere. Her work has been featured on RadioLab, Fresh Air, and TED, where her talk, “Three Reasons We Still Haven’t Gotten Rid of Malaria” has been viewed by over 1,000,000 people aro Sonia Shah is a science journalist and prize-winning author. Her writing on science, politics, and human rights has appeared in the New York Times, the Wall Street Journal, Foreign Affairs, Scientific American and elsewhere. Her work has been featured on RadioLab, Fresh Air, and TED, where her talk, “Three Reasons We Still Haven’t Gotten Rid of Malaria” has been viewed by over 1,000,000 people around the world. Her 2010 book, The Fever, which was called a “tour-de-force history of malaria” (New York Times), “rollicking” (Time), and “brilliant” (Wall Street Journal) was long-listed for the Royal Society’s Winton Prize. Her new book, Pandemic: Tracking Contagions from Cholera to Ebola and Beyond, is forthcoming from Sarah Crichton Books/Farrar, Straus & Giroux in February 2016.